Two things were very well known going into today's NCAA women's national championship race: (1) Sheila Reid was the favorite to defend her individual title, and (2) two-time defending national champions Villanova was very vulnerable at its number 5 spot. Both expectations were borne out. In a sprint finish, Sheila Reid beat Oregon's Jordan Hasay by 0.6 seconds to win her second consecutive individual national cross country title (Hasay was third last year). In the team competition, Villanova led the competition after 4 finishers were counted, but when everyone's number 5 had come home, Georgetown's depth won out and the Hoyas (trailing Villanova 82-106 after 4 runners) swept to their first cross country national title. Washington trailed Villanova as well 82-104 after four runners, but they were able to finish second. 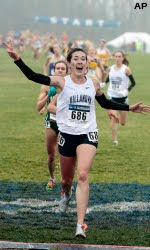 Sheila Reid and Bogdana Mimic (6th place overall) end their Villanova cross country careers as three-time All Americans.